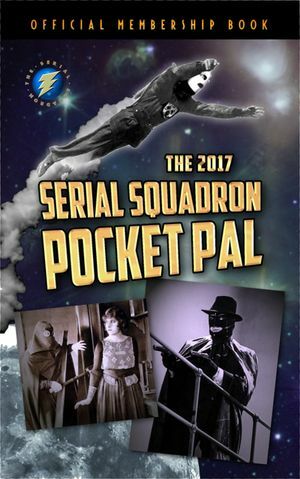 A 128 page paperback Squadron Member "Pocket Pal" Handbook which features an unprecedented list of all US serials, silent and sound, which are viewable on video, with concise descriptions of each and video recommendations. Directors, principal stars and chapter and studio info along with star ratings for serials are all also in the list. This will be an invaluable quick-reference for serial fans and cinema historians alike! The Pocket Pal (which may actually become your new best friend) also includes: Re-release and feature version titles, room to add addresses and contact information for your Squadron pals, a serial crossword, and the official Squadron Secret codes which will be necessary to decode secret messages that will appear here and on the website. The Serial Superheroes CD, including Buster Crabbe’s 4th portrayal of Flash Gordon! Once you have selected your Membership level on that page (there is no immediate charge for doing so) select your shipping option for the Membership Kit below and click the ADD TO CART button on this page. 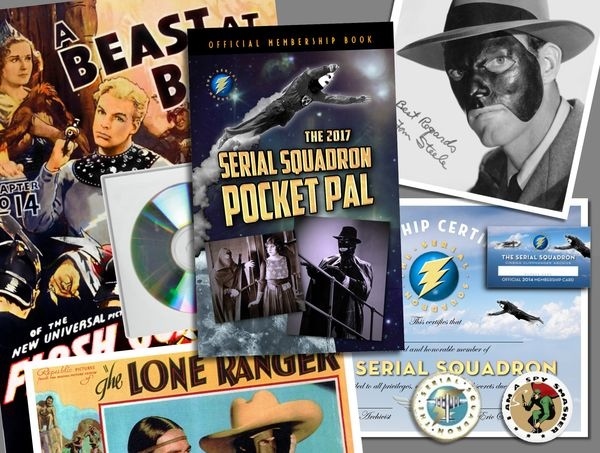 Thank you for joining the Serial Squadron -- we hope to bring you many great new and long-unseen serials in the future!